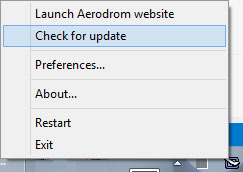 Aerodrom has been updated to version 1.2.2.0. Customers will NOT get the latest version with the automatic update feature because there was a bug in the latest versions. Fixed automatic update function bug. If you still have problems getting the latest version please use our customers download page. When trying to play some content from an app, I get a DRM copyright on my PC while it plays correctly on my iPad. What's the purpose of having buying it if it doesn't play on my PC? @Anonymous: Nice question. Purchased videos from the iTunes store are protected with FairPlay DRM by Apple. We are currently unable to remove this protection. It's not a video bought with iTunes at all. It's a plain video stream coming from an app named Shahid. It plays on my iPad but no video at all goes with Aerodrom because of this DRM error. It's a free app and its also a free stream on the Internet. So, why doesn't it play with Aerodrom? I feel like I bought your app for nothing if I can't play what I want. @anonymous: We will check on that app. @anonymous: we tried Shahid, but it seems the format provided by the app is not playable from our video engine (which is based on libav - the most advanced open source video engine). We tried the format on many other video players and all failed, only Quicktime on Mac seems to be able to play the content. As we have done in the past we will always continue to improve the product quality of Aerodrom and we will also include future updates on the video engine. Hi Funky, I'm a registered user since a couple of years back. Wanted to look for an upgrade and found nested on the FAQ how to get the latest by redownloading using the invoice ID, thanks for adding that info there! I have the new version installed and found that I still have a problem that been dealing with (plus a new one(. I start streaming music from my IPhone into the Aerodrom server and eventually the computer goes to sleep, so the server is not telling the OS something is playing. Can this be corrected? This runs over a media server that is intended to be reduced when nothing plays. Also found that the full screen playback with album (working great!) when the album moves from side to side, the window loses focus for a second and the mouse pointer becomes visible. Is not much of a problem, but is a bit annoying, because the album slides many times. Also, the track percentage is not working correctly, it shows always a full bar. Thank you very much in advance!